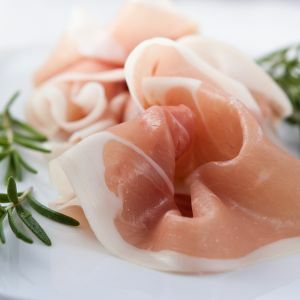 Prosciutto is a dry-cured ham that is usually thinly sliced and served uncooked; this style is called prosciutto crudo in Italian and is distinguished from cooked ham, prosciutto cotto. Saltimbocca is an Italian veal dish, where escalopes of veal are topped with a sage leaf before being wrapped in prosciutto and then pan-fried.Prosciutto is often served in sandwiches and panini, sometimes in a variation on the Caprese salad, with basil, tomato and fresh mozzarella. A basic sandwich served in some European cafes and bars consists of prosciutto in a croissant.